Fifty-five year old Franta Louka plays the cello at funerals to make ends meet. A gravedigger friend tells Louka of a Russian lady who is willing to pay a large sum of money to marry off her young niece so she can obtain Czech papers. The wedding takes place, but the bride illegally migrates to West Germany without telling Louka, leaving her five year-old son behind. The child, Kolya, ends up being cared by Louka, a lifelong bachelor with no experience in how to care for a child. The story takes place against the backdrop of socialist Czechoslovakia right before the fall of communism. This movie is not meant to be funny; the humor is very subtle but it makes you laugh out loud nonetheless. The child is so cute, and his plight so believable that it’s hard not to feel sorry for him. I found so funny that Kolya learned how to draw coffins, because that’s what he got to see all the time while Louka worked, and the child started drawing other things as soon as he was exposed to different experiences. 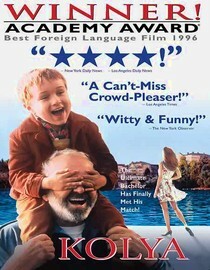 This film won a Golden Globe and an Academy Award to the Best Foreign Language Film in 1997. Well deserved, I say!